“She’s got a muzzle on her face and her hands are tied behind her back. And you’re still afraid of her? One thing is certain. The zombie concept that’s being used in horror movies is far from dead. I always wanted to use this expression in a review about one of the many zombie movies we are confronted with in recent years. And I thought that no film could surpass “Attack of the lederhosen Zombies“. A horde of bloodthirsty Austrians stumbling over a snowy mountain landscape, being impaled on ski poles and in the end being pulverized by a snowplow. These are perfectly normal events for a zombie movie. The fact that they are mutated because of a chemical substance which is going to be used for the production of artificial snow, is a new original fact. So no nasty virus that causes all the misery this time. 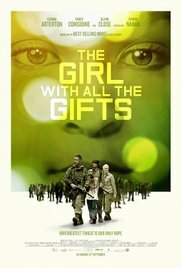 Looking back at “The girl with all the gifts“, I can only admit that they managed once again to portray the world of zombies (or rather “Hungries”) in an original way. Hence the definition at the beginning. Oh no, it’s a fungus. This time it’s a sort of fungus that transformed the world population into mindless, comatose creatures with an unquenchable thirst for human blood. The solution can be found at a military base. Young people are subjected to medical tests there, because they may form the basis of a possible remedy for this pandemic. They were born in a sinister way and are partially resistant to the malignant fungus. Although they exhibit symptoms of human-eating half-dead, they still function normally. Melanie (Sennia Nanua) is a highly intelligent girl with a logically working brain. She could well be vitally important. Without a doubt, this chapter in the film was the most successful and terrifying part of the entire movie. A bunker-like building with young children locked up in separate cells and who are brought to class on a daily basis, after carrying out the same daily ritual in compliance with strict security measures. As a group of “Hannibal Lecter”-like psychopaths, they are sitting in the classroom, learning about the Periodic Table. At that moment I started wondering what this was about. Why do those heavily armed soldiers fear these innocent looking children? A survival journey through zombie country. After a while, everything becomes clearer. And then hell breaks loose. This is the start of a survival journey through zombie country, with the aim of reaching a safer place. Among the survivors, who are part of this fleeing group, we find Helen Justineau (Gemma “Hansel and Gretel: Witch Hunters” Atterton) and Dr. Caroline Caldwell (Glenn “The Great Gilly Hopkins” Close), who have to traverse a post-apocalyptic England, together with a few soldiers. Obviously, Melanie is also present since her brain might contain something to solve the whole problem with. The two female members Justineau and Caldwell are diametrically opposed in their opinion about Melanie’s destiny. Dr. Melanie Caldwell sees her purely as a scientific object, while Justineau still tries to look at her as a human being. Certainly, this creates the necessary ethical and humanitarian conflicts. Praise the makers of this zombie flick. Nonetheless, first let’s praise the creators of this zombie flick who tried to breath new life into this totally milked horror genre. And more importantly, the rather brilliant acting performance of the fledgling Sennia Nanua, who really resembled Rudy Huxtable from “The Cosby Show” at certain moments. In a pure and convincing way, she shows the inner struggle she’s fighting. A cheerful and polite little girl fighting against that constant emerging urge. How Glenn Close (nominated six times for an Academy Award) ended up in this simple zombie flick, remains a mystery to me. And her acting isn’t groundbreaking either, so to say. Personally, I thought the first part of the film was intriguing and gripping. This level of fascination drops rapidly in the middle section. The same clichéd happenings as we know them from all the other zombie movies reoccur here. Again the same stupid decisions and not so original confrontations. When an exciting moment commences (like the zombie minefield in the mall), again this is spoiled by incomprehensible facts. Unfortunately, the number of exciting scenes in this film is shockingly limited. Even the scene with Melanie standing face to face with a gang of youthful “hungries” (they looked like “The lost boys” from Peter Pan) wasn’t really successful. But then again, the end was surprising in a way. Let’s hope the Brexit won’t cause something like this. All in all, this wasn’t a bad movie and they tried to be as original as they could. No, the zombie genre isn’t reinvented here. Not even by the use of different terminology and the introduction of blocker gel. But what makes this film stand out, is the acting of the young protagonist. However, there’s one thing that is abundantly clear after watching this quirky zombie. We don’t need to worry about one thing. A British zombie invasion won’t be caused by the Brexit! Just kidding.